Since finding out I was expecting baby number 3, I was really interested too see what the 'in' fashion was for maternity wear. I didn't really buy much maternity clothing when I was pregnant with Mia or Elliw, but I have bought a few things already with Baby boy because my bump has grown so quickly and so big recently. I am at my heaviest, weight wise, with this pregnancy than I was with my other two so I find it difficult to work out what size clothing I am. I have always had bigger hips, even when I was thinner. So trying to find the right tops to fit my frame can be pretty hard. I also don't have the best confident in wearing most of my clothes that I have upstairs. 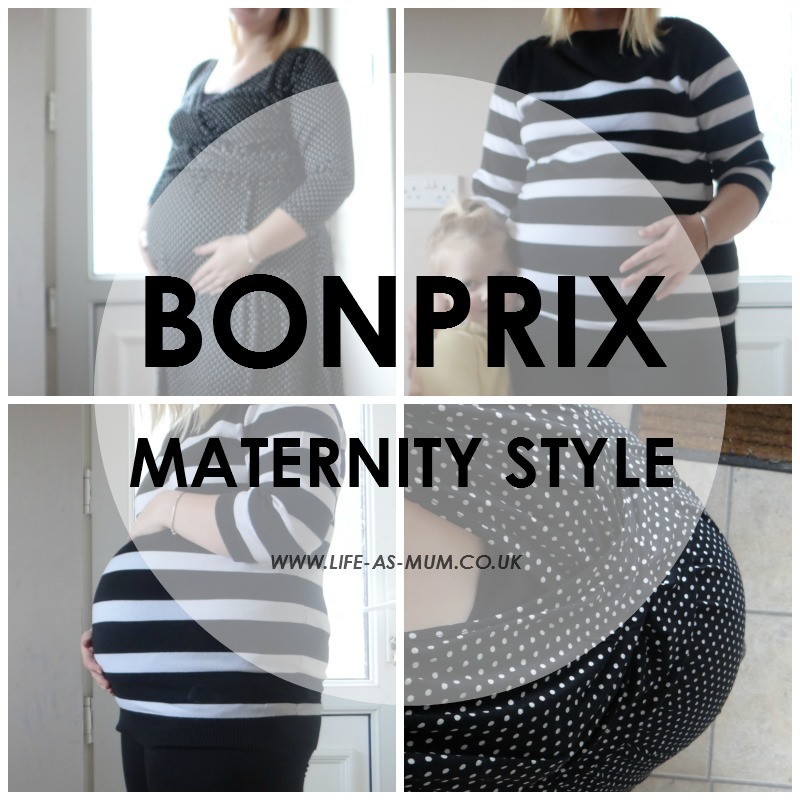 When Bonprix contacted me a couple of weeks back, asking if I would be interested in taking part in a maternity style challenge for this month, I said yes! I was interested in trying out their clothing as I had never purchased from there before. I was asked too choose some items from Bonprix's maternity range. They have a fantastic maternity range, with many items of clothing too choose from. After looking through their Maternity range, my first choice was this lovely Maternity dotty dress in black and white. This isn't what I would usually go for. But I thought I would have a change and see what it was like. This dress is perfect for nursing, so I can not wait to wear it more often when Baby boy arrives because this time I will be trying breastfeeding. The dress is really comfortable on with a comfortable stretchy material that lies perfectly on your bump. There is a nice V-neck detail and frill just below the breasts. I wore a black best under this pretty dotty dress and as you can see, it perfectly shows bump pretty well! This dress is avialabe in sizes 10/12 up to 26. It is also available in 3 different styles/colours - Red, Black or Black & Ivory. You can buy this dress for a reasonable £29.99. My second choice was this gorgeous Maternity Jumper. This black and white jumper instantly caught my eye and I didn't hesitate to add it too my list for this month's Maternity Style Challenge! This top can match up with leggings or jeans for a casual look. 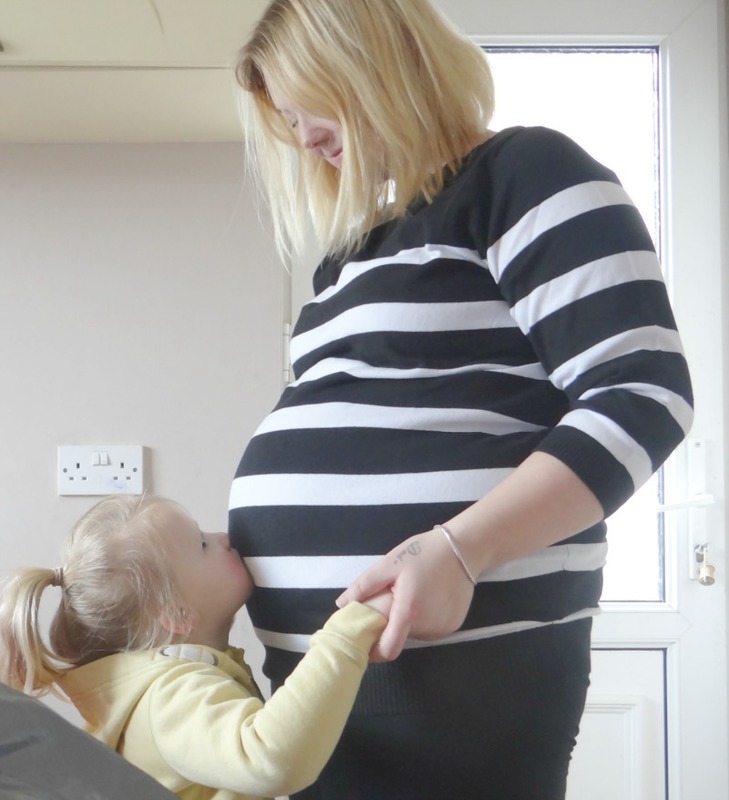 The knit material jumper is really comfortable and I can see this being one of my favourites too wear during this pregnancy. This jumper also comes in a midnight blue and white stripes top. I opted for the black and white stripe in a size 18/20 and it fits perfectly, with a loose fit. I wore this top with a vest and black leggings but also looking to match it up with some maternity jeans I have. * I was given these items free of charge in exchange for an honest review. All words, opinions and photos are my own, as always. I didn't get many maternity items when pregnant with Blake. My bump was small until the last few months. But leggings and jeans were my staples as they were more comfy than regular jeans. Great choices! I love the dress, it looks lovely on you. I don't know why but I really love black & white stripes on bumps, I think it looks lovely. Oh I really like all these. I love a bit of monochrome! I love the dress it's a really nice smart casual dress that you can dress up ur down to suit. I think leggings and stripey tops would be a staple for me if I was pregnant. That dress is so pretty and I love the jumper! Bonprix definitely sounds like a good choice for maternity clothes. They sent you some lovely bits I love the polka dot dress I bet it is more comfy than jeans that is for sure. I love how stylish their maternity range is! Love these! I bet maternity clothes used to be quite bland, which is ridiculous. I really like that dotty dress. Very nice! You're looking fab! Those totally suit on you. The color and stlye blended well. The only maternity clothes I had when I was pregnant was the jeans and a swimming costume. I just wasn't big enough, my bump was tiny!